On Friday (08/02) Indonesia Investments released the January 2019 edition of its monthly research report. The report aims to inform the reader of the key political, economic and social developments that occurred in Indonesia in the month of January 2019 and also touches upon key international developments that impacted on the Indonesian economy. 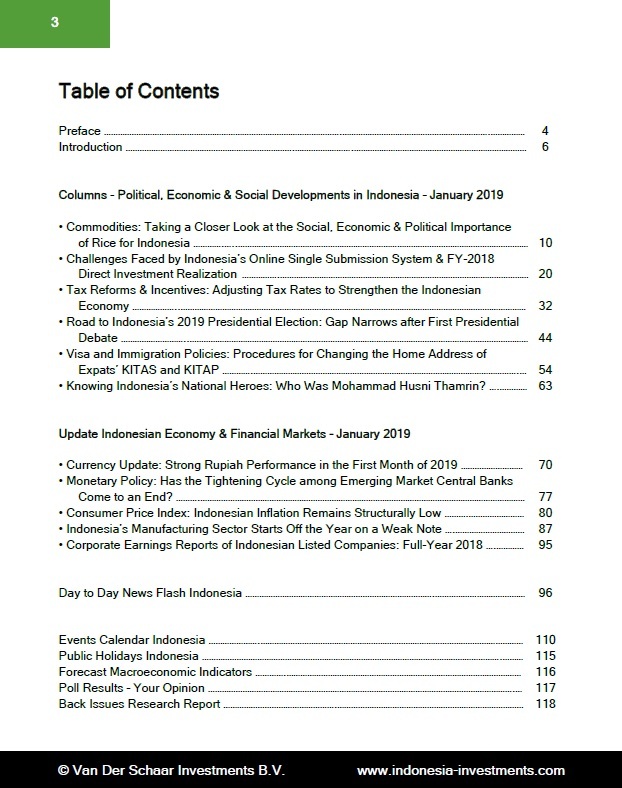 Besides updates on various topics - monetary policy, the performance of the rupiah, the consumer price index, and manufacturing activity - the January 2019 edition also includes in-depth columns on the topics of rice, tax, direct investment (as well as the performance of Indonesia's online single submission system), the presidential race, immigration matters, national heroes (MH Thamrin), and more (see the table of contents below).